Here’s something to wonder about: dogs that know when their owners are coming home — seemingly by telepathy. I’ve been rereading a book on the subject by Rupert Sheldrake. Here is one story as told by a woman named Elizabeth Bryan. My whole working life has been as a cabin crew member working out of Gatwick Airport. For ten years my dog Rusty would jump around and bark at the same time I landed and then sit quietly watching the front door until I got home. The astonishing thing is there is no routine to my coming and goings. I could be gone one day or fourteen and no regular time of landing, yet he knew without fail. Monika Sauer, who lives near Munich, Germany, carried out some tests at my [Sheldrake’s] request with her dog, Pluto, whose reactions were observed by her partner. Pluto reacted not only when Monika set off to come home in her own car but also when she set off in friends’ cars with which he was unfamiliar. I then asked her to come home by taxi. … The dog reacted not when she got into the taxi, but when she ordered it. 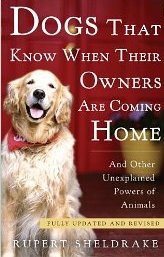 There are many more stories in the book, and they refute the explanations I would come up with (the dogs’ superior hearing is responsible; the dogs were pickup up cues from people who knew of their owners’ return; the dogs knew their owners’ routines; etc.). Could there be an extrasensory connection between some dogs and their owners? It seems impossible. What would be the medium through which transmission would take place? On the other hand, the idea of electromagnetic fields passing through empty space was considered impossible until the 1800’s. Why couldn’t thoughts be transmitted without the medium of neurons? What do you think? Is it bunk? Or do you know of people (maybe yourself) who have had this experience with their dogs? This entry was posted in Inspiration, Mind/Body, Science and tagged Inspiration, Nature, Paranormal, Science. Bookmark the permalink. It’s ‘cuz of their hair; it enhances their sixth sense. Quite some years ago, in the 60’s I think, the Army recruited Indians for their sixth sense ability in tracking and awareness. When they were satisfied that their mysterious ability was real, they employed them and cut their hair, standard issue. Magically, the Indian’s all but lost their ability to track and sense danger.